I understand Qwest and Comcast are the two main TV and Internet providers. What are some opinions on Comcast and Qwest for both TV and Internet. Obviously someone who has used both has the best perspective. 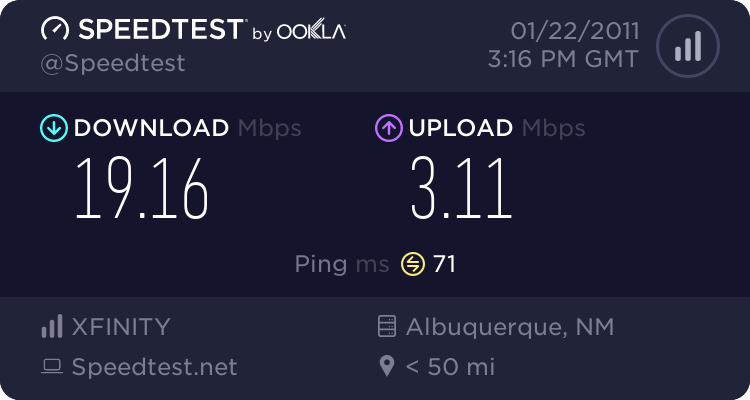 Qwest, 12mbps connection, on my laptop, which is connected to the modem via G wifi. My desktop, which is connected to the router via a wired gigabit router gets faster results. Jeep/Mopar guy. Explorer. Wanderer. Photographer. Computer and Electronic Geek. On another forum I saw this screen shot from Comcast. On the TV side, I'm not too fond of a dish, though it would be easy to implement on my new pueblo style home. To me the main need is the 'best picture', not 'most channels'. I heard a rumor that Comcast was only 720p (or even 720i). Is that true? I scoured their web site and can not find any specs. The problem with comcast is their speeds can vary widely, depending on time, network load, and equipment. 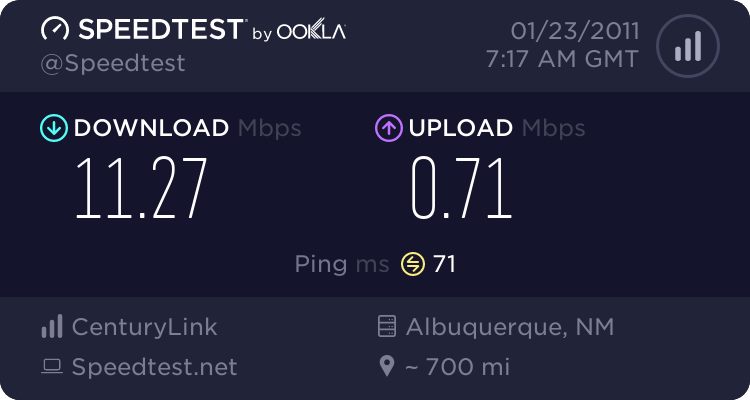 Even using a commercial account with minimum guaranteed speeds, i had speeds far below that during peak hours. This is all good background info. I won't be signing up until early May, so I'll just have to see what is available at my exact house at that time. I'm not too fond of the contract aspect of Qwest or their only TV offering being dish. Qwest speeds depend on where you buy. They've run fiber down many major streets, then it's still copper to the house. We're a block from one of those major streets (Spain) and could get 40 mbps if we want to shell out for it. I think that if your house has a long copper run to a fiber hub you could be 1.5 mbps. Qwest speeds depend on where you buy. They've run fiber down many major streets, then it's still copper to the house. I just went to their web site and played around. My 1823 address (house being built now) was 'not valid' a few weeks ago, so I used 1860 addr where I knew there was a house, which came up with 12M max. Today I tried 1839 (my guess at another existing house) and it came up with 20M max. I then tried 1800 and got 40M max. Finally I tried my 1823 again, and now it worked (building permit now?) and shows 20M max. Comcast offers 15dn/3up to the 1860 address. However, it only offers 896K up speed, pretty poor for a household that maintains a few graphic oriented web pages. My copper run is 23 feet. Custom run with weatherproofed, insulated Cat6.